The true essence of a successful New York City fashion girl is well represented in this image. The Sartorialist took this striking picture outside the Louis Vuitton boutique on 57th Street. Apparently this young woman works for Louis Vuitton and was on her way to the store to make last minute checks for a party that was being held that evening. When I think of New York fashion publicists working on 5th, Madison or 57th Street, this is the image that pops up in my mind. Not only do they have to work hard (like the rest of us) but they have to always appear proper, put together and utterly chic - (even on a 3 hour night sleep/deadline driven day) - now that is a job within itself! Combing through the Cannes Film Festival pictures on elle.com, I came across this stunning image of Doutzen Kroes. At first I thought she was Carolyn Murphy or even perhaps Laetitia Casta. The girl in the image completely captivated me and I thought to myself this has to be a supermodel of some sort but to my surprise it was Doutzen Kroes. Perhaps more famously known as one of the world's next top models declared by Vogue (May 2007) and highlighted on the cover. I really enjoyed Jonathan Van Meter's article, "Hit Girls", where he spoke about this up-and-coming beauty named Doutzen. "It is pronounced Doubt-zin, not Doot-zen. Practice it a few times...what is important, however, is that you learn to say her name properly because in about ten minutes she will be everywhere...," he said. After viewing this striking image I could not agree more. Doutzen, (and I am starting this first name basis thing already, because I am quite confident that we will soon come to know Doutzen just as we do Gisele), is 22, from Holland, and surprisingly was not discovered like the typical scouted model, she sent in pictures of herself to an agency. Looking forward to seeing more of Doubt-zin. Watch out for her! I love this mentality of dressing - getting dressed for the sake of getting dressed. It may not be practical but it is fashion at its purest. The mentality of the past is not what is the present. Before we had walking dresses simply for walking, today we have ripped jogging pants as a wardrobe staple. What has happened to fashion? The dress of the season, well at least for myself and Bonnie Morrison, is this fantastically chic and versatile Calypso dress. I discovered it while watching style.com's summer shopping guide series, Bonnie Morrison had it on and declared it her favorite, so much so that she bought it in every color. She pointed out the fact that it has pockets which makes it so practical. 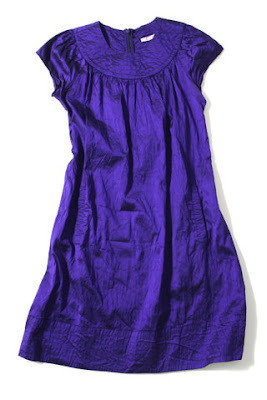 I love the loose fitted shape, the punchy color and the seamed neckline, which adds that subdued style element that makes a piece so unique. You could definitely dress it up or down. I see it by day with leggings and flats, and by night with tons of gold chains and strappy sandals . One of my definite summer purchases. Available online at calypso.com. Style.com is featuring summer shopping tips by 5 of the industry's so-called experts (a mix of stylists, editors and PR gurus). I think it is definitely worth checking out. It is fun to see different thoughts and opinions from different girls in the industry. For example, Bonnie Morrison of the famed KCD press agency despises rubber flip flops, while Kate Young, stylist to the stars, thinks they are fab. The videos serve as a great interactive element. I think it is so much better than a bunch of words and images. The videos actually bring the whole story to life. It is an entertaining and interesting feature and I hope to see more of these industry girls spieling on the industry. There are so many of these so-called expert girls in NY that style.com could do this type of feature daily for a year. It's great to see all the people behind the seams, instead of just the models or designers, or even the overnight celebrities. It is so much nicer to see the real people, hear their thoughts and learn from the ones who are actually running the industry. I think that these people should be flocking the covers of our fashion magazines. My favorite reviews were Bonnie Morrison and Kate Young. Check out the entire Shopping Guide video series on style.com. Lindsay Lohan must be getting used to modeling by now, as she has posed for Chanel and Miu Miu to count a few, and come fall 2007 we will be seeing her sexily clad in nothing but a peek-a-boo short and an oversized handbag for Jill Stuart. I am definitely not a Lohan fan but I think she looks fantastic in this campaign. I love her hair, well the overly coiffed, extension add-in, picture ready hair. It's nice to see Jill Stuart advertising again. I love seeing contemporary designers doing print ads. Ads will run in all major magazines starting in August. My first stop on my supposed shopping jaunt throughout Los Angeles was Kitson (of course, where else would it be). Unbeknownst to me, they were serving pies! In support of the movie, Waitress (in theatres now), Kitson dedicated an entire weekend window display promoting the film while feeding their most loyal patrons. The window display featured live model waitresses, all dolled up in the uniforms (used in the movie), overflowing into the store and out onto the sidewalk. I thought this was an excellent marketing tactic, amongst other factors, it created buzz, bringing in customers, media, and even celebrities (Posh Spice made an afternoon appearance, I guess before she made her way down to the Santa Monica Airport for the Chanel Cruise show). The window display was well done - professional, fun and unique. I didn't really see any promo items tied into the display/movie, I may have missed it but there should have been some kind of quirky items available for purchase. My mission (dropped the sunglasses mission(see previous post)) was to purchase a Prada turban. I recently just decided that I am rather fond of these satin head pieces from the spring/summer collection. The Rodeo Drive store was heavily promoting the headband version as they outfitted every one of their entrance mannequins with the m. On the hunt for these turbans, I searched the entire store three times before I had to ask for help (I don't really like asking the sales people for anything unless I really need to). The very nice sales associate led me to a supply closet where he pulled out a shiny yellow one (unwrapped) and indicated they were all sold out. I was quite unhappy but I guess their stock out saved me $620. Yes, $620 for a piece I would barely wear. I guess I had a temporary obsession (which I have now completely got over...I have moved on). Yet, the gigantic billboard advertisement on Sunset Blvd. featuring a purple turbaned model kept as a tempting purchase reminder. As I thought this trip would have been a shopping extravaganza it turned out to be a laid-back affair. I didn't get to any of the vintage shops that I planned on visiting, yet I did take a day trip to Laguna Beach and Malibu, which were both quite nice typical Californian beach days. Surprisingly, I didn't make many purchases, yet these Armani Exchange bangles have become my favorite purchase as I have worn them everyday since I bought them in the Sunset Blvd. boutique. Also available online at armaniexchange.com. I will be headed to LA this weekend and will not post until Monday. I plan on scoping out some shops. I will most likely do the typical Kitson, Fred Segal and Tracey Ross, but I really want to focus on the vintage stores- Decades, Resurrection, and Paper Bag Princess, as well as some that I haven't been to yet - Wasteland, Squareville, Slow, Industry Rag and American Rag. 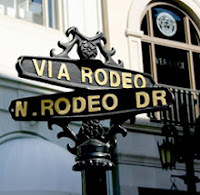 I may even swing by Rodeo Drive to see what the designers are stocking. I hope I find some great pieces, even if it is just to report back. My planned purchase is for a new pair of sunglasses as mine are dated. I think I am going to go for the trend and hit up a pair of oversized ones. 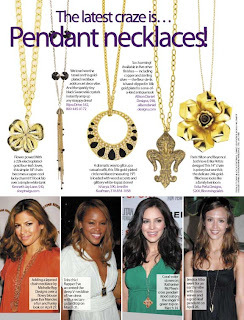 And I am always on the alert for new jewelry...really hoping to score some great baubles. Will tell all when I return. I love this shot from The Sartorialist. I don't know really what it is but I think this shot is unique. I love this girl's randomly put together outfit, her attitude shines through the lens, the background, the lighting -I think it is a combination of all these things that keeps drawing me to this image. Love the mirror necklace. Jaslene was chosen as the winner for America's Next Top Model Cycle 8. I think that with this season's girls, Jaslene makes a great Next Top Model. She is slightly on the too skinny side, but I will not venture down that road. I think she has a classic beauty to her, she photographs phenomenally, has a typical model body and has a nice catwalk presence. She even has the perfect model name! I do think however she needs a little more refining, especially in terms of her speech but that will come (hopefully). I look forward to her foray into the industry. Yet, I am still waiting to see the winner of America's Next Top Model make it really big. Karl Lagerfeld will be unveiling the Chanel 2008 Cruise Collection this Friday at Santa Monica Airport. It seems as though Mr. Lagerfeld is keeping with the travel theme for his cruise collections. Last season was staged at Grand Central Station in New York, this season he choose air travel on the West Coast, and perhaps next season will be on a yacht off some coast. What I loved most from the 2007 cruise collection was the gladiator sandals. I think they have such a cool air to them. For someone like myself, a runway-to-reality version would be the minis. My legs are no where near worthy of being strapped and exposed. I can't wait to see what specialities are in store for 2008. The house of Pucci turns 60 this year. To celebrate, none else but the requisite parties will be taking place this weekend in the house's city of origin, Florence, at the grand Palazzo Pucci. I am actually quite a Pucci fan and am happy to see the house reign. I wish Pucci un altro cento anni! 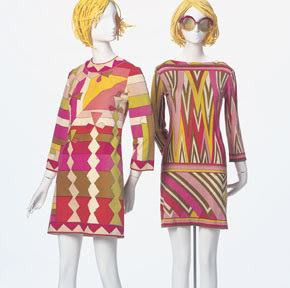 I found these Pucci dresses from the sixties, what a resemblance to the silk dress from the spring/summer 2007 collection, not only is the print similar and keeping with the classic swirls, but so is the silhouette. It seems as though Matthew Williamson has been doing his homework. 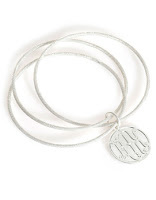 Available at netaporter.com. I discovered this beauties on net-a-porter.com , they are my absolute must-have heels of the season. 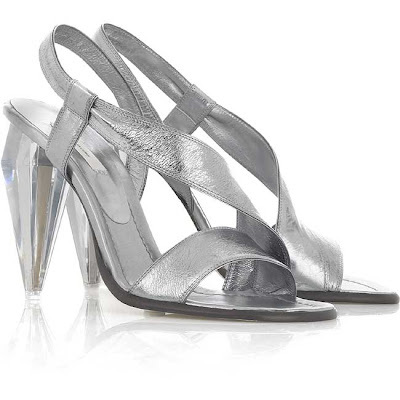 I love metallic heels and probably have close to 12 pairs of pumps, sandals and flats combined but with its diamond cut Perspex heel these Marc Jabobs' are just divine . I love that the heel adds a whole new dimension to an otherwise ordinary strappy sandal. Available at net-a-porter.com. Vogue and style.com brings us inside the MET for the Costume Institute's party of the year. I love the smattering of fashion that an event like the Costume Institute's Annual Gala presents. In general everyone looks divine - people are happy (or at least appear to be), everyone is in good spirits, the energy is high and above all that, everyone is dressed up. Yes, dressed up. We seldom get dressed up anymore, unless it is for events such as these, and that is why when these events happen, whether it be a fashion event, charity ball or an awards ceremony, it is just simply delightful to see everyone dressed up. Rather than pick out the worst dressed or the best dressed, rather than tear someone apart for wearing a questionable gown, we should all just rejoice in the fact that people still put in the effort and go the extra mile to dress up. I think all the dresses that ascended up the Met's grand staircase were all noteworthy, yet is was Zani Gugelmann that really stood out. She took the night's theme to new heights as she sported a traditional era head piece. I love that she did that. She took a risk, yes, but more importantly she had fun with getting dressed up. I think we should all take clues from Ms. Gugelmann and take more risks and be more creative. For instance, why aren't more people wearing those Prada turbans? I find that, when it comes time to dressing, we tend to play it safe, myself included. And to that, I sincerely think we need more Zani Gugelmanns. We need our own Poiret era, so when people look back to our time they will see that fashion was about something and not just a regurgitation of yesteryear. This evening will mark one of the industry's biggest nights when the A-lister fashion crowd flock to The Metropolitan Museum of Art for the annual Costume Institute's gala. This year Paul Poiret will be honoured with an exhibit coined, "Poiret: King of Fashion", highlighting the designer's fashion legacy. According to WWD, "the show highlights a largely neglected aspect of the designer's creations — the modernity of his garments and their construction." Jennifer Hudson, cloaked in Michael Kors, will be the evening's entertainment as she will belt out tunes that will make the crowd shudder in their Jimmy Choos and Christian Louboutins. And what a crowd it will be (as always it is), Fashion Week Daily has reported on this year's attendees, "Among the other expected guests are Jennifer Lopez and Marc Anthony, who are attending as guests of Bruno Frisoni at the Roger Vivier table...Hilary Swank is expected with Donatella Versace; Julianne Moore and Gisele Bundchen with Stefano Pilati; Lucy Liu with Zac Posen; Giorgio Armani's niece, Roberta Armani, will arrive with Alicia Keys, John Legend, and Molly Sims; Helena Christensen, Liv Tyler, and Kate Hudson are slated to sit at Calvin Klein’s table; Scarlett Johansson at Louis Vuitton's; Julia Restoin Roitfeld is going with Phi; and Sophie Dahl will be Roberto Cavalli’s arm candy that night..."
The gala will be underwritten by Balenciaga with additional support by Conde Nast. It will be co chaired by Cate Blanchett, Balenciaga's creative director Nicolas Ghesquire, and Vogue editor in chief Anna Wintour and PPR chairman Franois-Henri Pinault will serve as the honorary chair. 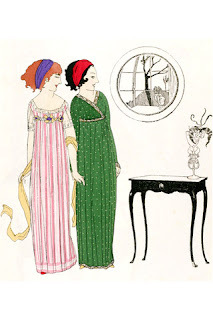 Side Note: It is definitely worth checking out Style.com's Paul Poiret feature . The exhibit runs from May 9th - August 5th, 2007. Gisele Bündchen may have lost her Victoria's Secret wings but has quickly replaced her angel occupation with YSL. Bündchen has been plucked by Stefano Pilati as the new face for Yves St Laurent. The YSL fall/winter 2007 campaign will feature a sexily clad Bundchen gallivanting throughout the streets of Paris by night. The ads (as what I can see from the photo preview) seem to be a change of pace from the rather repetitive, structured off beat tone the house has been favoring for the past two years. WWD reported: "Inez van Lamsweerde and Vinoodh Matadin captured Bündchen cavorting in the streets of Paris at night. According to Pilati, that's a moment ripe with possibility, when a woman can pursue a "double life" — should she be so inclined." I am happy that the house, or rather Pilati, is injecting a much needed dose of intrigue, sexiness, glamour and luxury into the advertising. I love ads that inherit some sort of dreamlike essence to them. Advertising, I think, is meant to sell, and not necessarily the featured clothing but the experience that comes when wearing the clothes. I believe we all need to dream, especially when the world around us is being drowned with hardship, we all need that little something to take us away... and I believe that fashion advertising has that power. I am quite excited for the fall/winter ad campaigns, especially YSL. And yes, why can't I dream that I can one day be a Gisele frolicking about the streets of Paris at night? Alice Temperley , the London designer best known for her chicly fabulously dresses will be designing a holiday line for Target slated to launch October 2007. Temperley will be part of the retailer's ongoing designer collaborations that have included Luella Bartley, Behnaz Sarafpour, Proenza Schouler and presently, Patrick Robinson. Gisele Bundchen, one of Victoria's Secret's beautiful angels will be turning in her wings. Apparently the super model's financial demands were not in line with that of Victoria's Secret. Bundchen will continue her model duties until the end of the year. 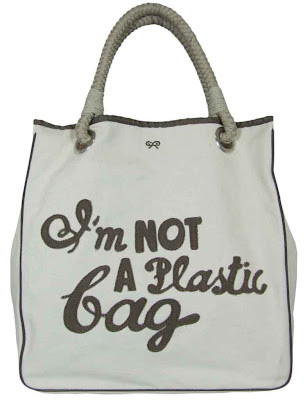 Anya Hindmarch's recent "I'm Not A Plastic Bag" launch fits right in with this eco-friendly environmental revolution. (I wish I would have seen an Anya Hindmarch booth at The Green Living Show). The grocery bag was created in association with the social-change movement We are What We Do to raise awareness on the excessive usage of plastic bags and in effect reduce its usage. The limited-edition bag, which retailed at 5 pounds, ended up selling out. The press, as well as many celebrities went into frenzy when it launched. It is great that the bag was created as a green imitative but it quickly became the trend of the moment. I guess that whether or not it became an "it" item is irrelevant as it sold out, raised a substantial amount of money that went direct to the organization and brought awareness to the issue. I think it is great that Sainsbury’s (one of the U.K.'s leading grocers) launched the bag in 450 stores this past week, this shows that the high fashion trend is trickling down into the main stream. The bag will launch in the US in June (in a limited edition navy blue) and in Japan in July (in a limited edition bottle green). Available to pre-order in May at anyahindmarch.com.